Oily Water Separators (OWS) are being used onboard ships as a regulatory requirement of MARPOL conventions. Their main use is to clear the water that has been accumulated in ship's bilges and produce water that its contents is within acceptable limits in order to be discharged overboard. OWS are mainly installed and used onboard to protect the environment and consequently the public interest. Therefore since they don't produce any "measurable" profit for the ship owner and because they don't play a critical role to the ship's structural or operational safety, they don't get the attention they should be given as a system. 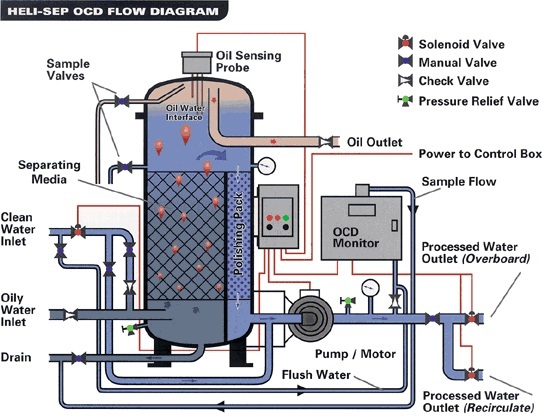 At the beginning the OWS were required to reduce the oil in discharge water to 100 ppm. Therefore ships could discharge waste water as long as the ship was underway, at a safe distance from shore, and of course not in sensitive areas as defined by regulations. In 1992, the discharge standard became more stringent requiring oil in discharge water up to 15 ppm and therefore problems became apparent since the equipment onboard was not operating properly. At the time the attitude was to have whatever OWS equipment was needed onboard according to minimum regulatory requirements and "let it be". Additionally the crew was not being motivated in order to show any interest on the operation of such equipment and of course not to mention that the OWS is not the only equipment that needs attention onboard. Engineers often modified OWS systems to their "liking" in order to fit their operational needs, or because the operational instructions of the system by the manufacturer where poorly written not giving specific guidelines. This of course was not the right thing to do but it worth taking the risk in order to have an engineer occupy himself with the rest of the ship's machinery and equipment. Such practices mentioned above, at least at the early stages of using OWS systems, were enhanced by the fact that surveyors, often directed to evaluate the condition of OWS systems for various stakeholders, were unable to arrive at a conclusion on the condition and functionality of an OWS by simply looking at it and inspecting the Oil Record Book. This happened mainly due to the physical design and purpose of the OWS systems. Of course these days are over and nowadays it is not easy to avoid in an inspection the OWS system being checked and a deficiency (and possible violation) be left unseen from the inspector. Especially in the US, authorities are very much interested in pursuing ocean dumping cases, in particular OWS (or "magic pipes") incidents, where equipment is installed in order to by-pass shipboard OWS, and consequently ship's logs regarding waste discharges are being altered containing false records. The penalties include prison sentences, non-financial penalties (e.g. Environmental Compliance Programs) and of course exclusion from US waters for the probation period. Treatment technologies of the Oily Water Separators can be summarized according to the method that is being used to separate oily mixtures. The following information has been extracted from EPA's 2011 report on Oily Bilge Water Separators. Gravity Oily Water Separators: Gravity OWS use parallel plate or filter coalescing technologies to separate oil from water by using the different specific gravities of the two liquids and their immiscibility with each other. Bilgewater is heated to approximately 120° F prior to OWS treatment in order to improve the separation of oil. The OWS contains a coalescing material, which is typically polypropylene that may be in the form of parallel plates or loose packed media. Free and dispersed oil droplets in the bilgewater adhere to the coalescing material as it passes through the OWS. These droplets continue to coalesce and then break free from the plates or media and rise to the surface of the OWS tank. The OWS contains sensors that detect the presence of oil and trigger the OWS to automatically pump the collected oil to a waste oil tank. Centrifugal Separators: Centrifugal separators, like gravity OWS, employ the difference in density between oil and water and coalescence of oil droplets to separate oil from bilgewater. However, they do so by greatly multiplying gravity using centrifugal acceleration. In addition, high centrifugal force can mechanically induce flocculation and coagulation to separate emulsified oil. Compared to conventional gravity OWS, centrifugal separators are compact and highly efficient, do not require large bilgewater holding tanks and generate minimal waste volume. Polishing Treatment For Bilge Separators: The addition of treatment stages makes bilge separators more reliable by providing some redundancy to withstand problems or failure of individual stages. This includes one or more polishing steps which is an added cost to the operation of a ship. Most certified bilge separators combine several post-gravity OWS/centrifuge unit operations such as: Biological Treatment, Coagulation and Flocculation, Flotation, Membrane Technologies (ultrafiltration). These technologies can all be considered post-OWS polishers, as gravity OWS (or centrifuge) treatment is a typical first step for bulk removal of non-aqueous phase components. All bilge separator treatment systems generate oily residuals and sludge. At a minimum, the effective treatment of 1,000 gallons of bilgewater containing 500 ppm of oil will generate 0.5 gallons of oily waste. Actual residual generation varies based on the characteristics of the bilgewater and the specific treatment technologies used in the bilge separator. Residuals generated by treatment technology are summarized in the table below. All vessels over 400 GT are required to have an oil content monitor (OCM), including a bilge alarm, integrated into the piping system in order to detect if the treated water that is being discharged from the OWS is in accordance with the discharge requirements. The OCM very important to the OWS system since it can stop the process of discharge of oil from the vessel in case of a bilge separator failure. OCMs require continuous maintenance and cleaning to avoid malfunctions. looking for marine surveyors dubai and any kind of marine services in dubai. we are here we made with appraisals from clients for speed of response and reliability for Quick Response Quote send your enquiry to const24x7@constellationms.com or call 00971501889614. Every one should read this, I like the types of Treatment technologies which help me to understand the process of Oily water Separators. I want to read your other articles also. Interesting and valuable information here. Oil water separators are also commonly known as oil-water separators or oil and water separators. This is because its primary function is to filter or remove oil from tap water or wastewater. The treatment ranges from above to underground areas. In order to make it work efficiently, filters and other devices are often included in the system.